Hmmm, I said, we love pipe tobacco growers, right? Then I read that he managed to visit Eskisehir - the Meerschaum mining heaven of Earth. That was it, this guy had a lot to share with us. Right, rajangan? When a mod starts a thread to welcome a new member individually, yes, I would think he might have some things to share! Hi, thank you for the warm welcome. I live in Alberta. Not exactly tobacco growing country. After floundering for several years, I have since managed 4 successful crops. The most I've grown was 200 plants. My stock of tobacco is such now that I'm only planning 75 this coming year to maintain stock, and try new varieties. I built a flue curing shed two years ago. This year however, I will be focusing on sun cured and air cured varieties. These include a couple burleys, Indonesian sun cured tobaccos, a rustica, and an uncommon category called dark Virginia, and an Italian cigar type called Nostrano. 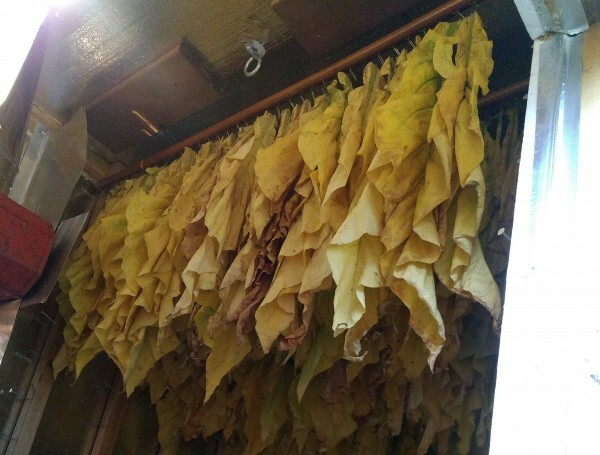 Last year I did an experiment, curing a bright tobacco in the Indonesian method for making what's called rajangan. It's a sun curing method where the uncured leaves are shredded and then cured in the sun. 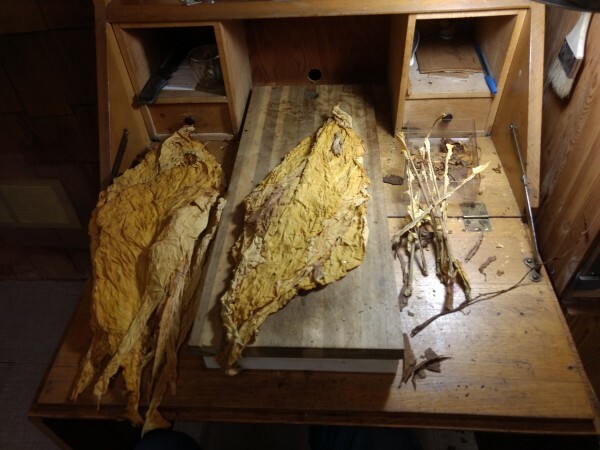 It was successful producing a smoke that was unlike flue cured, regular sun cured, or air cured tobacco of the same variety (which I also did), so this year, along with my planned air cured tobaccos, I plan to make rajangan with three different Indonesian tobaccos--ones that are traditionally done that way. Thanks for your response. I've never heard of Nostrano. I know that they grow Kentucky tobacco in Italy and process it to manufacture unique Toscano cigars. Is Nostrano similar to that one? Funny, yesterday in the mail I received a package of Virginia seeds in the mail from the Ukraine. I couldn't read any of the writing, but it was all hand addressed. It didn't look like it was from a company at all. But, I make so many exchanges, trades, requests, and surprises from fellow forum members, that I may have just forgotten that someone was sending them to me. I hope I wasn't supposed to send something in return. Anyways, welcome Rajagan. We have a lot in common. I am a grower as well. I have started digging out the foundation for a small smokehouse for fire cure, and I have gathered the materials for a new flue/fermenting chamber. I have grown the dark Virginia, and it is delicious with a lot of strength to it. I'm not a fan of sun or air cured. It just tastes bland to me, after playing with flues, sweats, and fermentation. But, maybe someone else can do it better than me. I look forward to hearing tips and seeing your crops progress. Brenta, Italy is the first region in Europe where tobacco was ever grown. Monks or friars did so, I'm not sure. Nostrano is a descendent of those original tobaccos. While Nostrano del Brenta cigars look like Toscanos, I'm told they taste entirely different. Those I know who have smoked it don't regret growing it, and all say it's very unique. In photos I've seen, it cures very dark, and makes a gorgeous wrapper. Growing your own is the future. This curing method is new to me and sounds interesting. What does shredding the tobacco do, besides tempt you to stuff it in a pipe too early? Cosmic, building a safe way to fire cure is exciting. I hope you do well at it. I am using parts you can buy from Amazon for building your own meat smoker. The smoke box has an electric pellet burner, so it is safer, or we will see. I may have some exciting pictures of a small burning building to post, ha ha. Deathmetal, the rajangan had a much richer flavor than the flue cured. I don't know if you've smoked Gitanes cigarettes. Something like that, or maybe like drum, but still earthier. One great benefit of it is that since it's already shredded, you can kiln it in a jar and not have to worry about regulating the humidity. It's ready to smoke in no more than a month after picking. Mind you, Delhi 34 was the fastest maturing tobacco I've ever grown. The Indonesian types might not go so quickly. Very interesting. I used to smoke Gitanes and noticed that Chinese cigarettes tasted more like them than American or British cigarettes. I can also see the advantages to the fast maturation time. I'm attempting to post my first photo. If this works, this is the rajangan immediately after curing. Wait, are you a commercial tobacco producer? Cosmic, nope. Just a hobby grower. I think I would like to do this full time, but there's more realistic stuff going on in my life that will do me just fine. I hope it's worth all the efforts in the end. It is certainly a unique process, and very interesting to read through all the postings. That is a damned impressive shed. This is just for your crop? or is it a cooperative with different farmers using the same equipment? Because that is some money right there. Mine is going to look Samford & Son in comparison to your Howard Hughs Spruce Goose flue. Cosmic, pipe tobacco in Canada runs about $300/lb. I save about $1800 a year by growing my own tobacco. The shed has paid for itself already. It also doubles as a place to refrigerate or cure meat, grow seedlings, etc. The inside is 4'x8'x8'. There is 7.5" of insulation, 6" studs, a series of uprights to hang tobacco rods, a small vent for dehumidification, heater, humidifier, a sturdy roof in case I ever need to hang a quartered moose. It's just for me. Tobacco photos! Yaaaaaaaaaay! Welcome Rajangan! Welcome Rajangan. Your pics make you look like a pro to me. I live near Lancaster Pa, so there are a lot of Amish tobacco farms around here. I have been curious to see if i could by bulk from one of the farms , and try to cure it myself . I have had local Amish chewing tobacco but not pipe tobacco. Welcome mate. I haven't been here long myslef but can vouch for this group of folk as genuinely nice and fun people to be around. I would love to get into tobacco growing - my parents, and their families had commercial tobacco farms in Italy.... But I definitely don't need another hobby / interest to absorb myself in right now! Paulie, I'm jealous that you have had the opportunity to buy some of these regional tobaccos. Voor oogst is a term meaning something along the lines of, planted in rainy season, and actually is not a specific tobacco. Unlike most cigar leaf, which is na oogst. 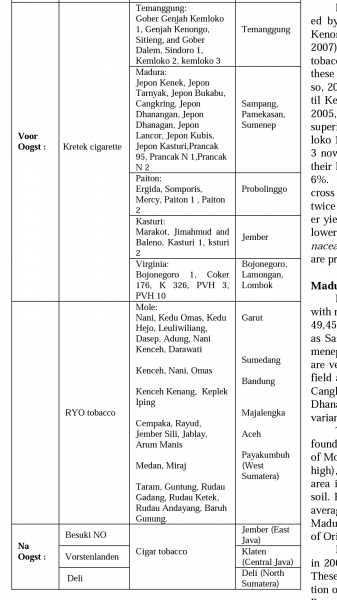 Mr.Rajangan: Thank you for the added information,tell you what, based on my observations with the Ryo tobacco produced within European Union countries, something strange just happened with all main Roll Your own tobaccos excluding perhaps very few smaller British and Belgian Tabac de Semois producers,all major brands started to taste much weaker and nicotine-wise they went significantly milder,whereas in the far east and perhaps in the U.S,(outside of Eu )the strength of these main European cigarette tobaccos still remain pretty much unchanged,similar situation is seen with the factory made cigarettes,and thereby, I have a reason to believe that the use of lower tar and nicotine containing leaf has a very bad effect on overall taste of the final product. That's very interesting Paulie. I wonder if it's due to cultural and/or political reasons. There are Javan cigars? Really? Edit: I've just realized that you were talking about Indonesian tobacco, so probably it is Java leaf (like Cuba-Cuban, Java-Javan). Yup, that's actually how some people smoke it, cutting it in half with a cigar cutter or knife and then smoking one half. If you roll your own, WLT has a really good Bezuki wrapper from Indonesia. I like Toscanos. One great thing about them is traveling in Europe they are usually available in the duty free shops. Does anybody know if De Nobili Toscani is similar to Italian Toscanos? I purchased a pack of 5, however never had a chance to try it. Yeah. They are similar, but not exactly. They are still very much along the same lines flavor wise, but not quite as strong. Rjangan:All that comes from new EU regulations and directives on tobacco products. That's an amazing setup, Rajangan, inspiring. This thread, coupled with recent claims of tobacco quality, made me want to learn a little more. My best friend grew up in Northern Kentucky and his dad has a 'hobby farm' where he grows 40 acres of tobacco to sell. He has been doing this for about 30 years. I called up my buddy's dad and had an interesting conversation. I'm summarizing, but he basically told me that curing is the hard part in production. He told me that through modern agriculture, he can get a consistent crop but that curing the crop requires much more skill and experience. Rajangan has this been your experience as well? I would say that his challenge is far greater than that of the homegrower. He needs to do it in a financially responsible manner. Also, he has to meet certain standards with his tobacco so it gets graded at a higher value. For me, it's all sort of an experiment, right. Much of my tobacco is great, some of it is not, and it is not entirely consistent-a challenge he has to deal with. I can welcome inconsistency because I get variety and learn about how the process affects tobacco differently. And when I consider the cost, I compare it with retail, not wholesale prices, so I can have 7.5" of insulation, electric heat and humidity, fans, controllers, etc. My system is a little overkill, but it can flue cure when it's minus 20 outside (I live in Alberta). It can be done with scientific precision if the equipment holds up. Meanwhile, this gentleman has to do it in barns, subject to environmental fluctuations, human staff, fuel of some kind, wood I assume, rather than electricity. It's an artform, maintaining the right conditions for a crop a thousand times the size of mine. I can say, though, that to do it for fun in your own back yard can and does give great reward. And you certainly don't have to invest in it as much as I have. Every year is a little better. It's worth it. Tobaccopocalypse is like civilization decay: it happens slowly in little bits and you do not notice at the time, but then one day you wake up in a favela lighted by a Coca-Cola billboard as helicopters circle above and gunfire breaks out on the streets next to the open sewers. It's good to be prepared. If pipe smokers are going to be a marginalized group, we do best to develop our own industry and trade around leaf and briar instead of being dependent on a failing economy and infrastructure. The growing part is easy. Starting the seeds just takes planning. But, for months all you have to do is check them for worms, and pick them off as you find them. Topping is easy. But, I find gardening easy anyways, and my daughters all love to help me. So, yeh, curing and fermenting and sweating is the art and science part. It’s where the magic happens. I have just been using my shed and a tiny bit of electricity to flue cure, but this year I am investing a lot more to get a fire cured Virginia. But, it’s a hobby for me, a chance to get something i cant buy. So cost is nothing, although I hope to use the smokehouse for years and maybe for deer jerky (stealing your idea rajangan). But, getting into pipes, I tried just mixing some stuff to get blends, but it felt like I was just working with someone else’s artwork. As it just didn’t feel creative, to take someone else’s cured and cased tobacco and mix it with other cured tobacco. To me, it’s as creative as putting together a jigsaw puzzle, and I would rather paint the picture from scratch. (Not to disparage our resident mixers and blenders). But, I just want to control the art from the beginning to end. The problem is that books on curing were way too technical and boring. Websites and forums were unreliable with sketchy results at best. And, tobacconist never responded to requests or they had no idea about the detals that it takes to cure. Not to disparage them, as they most likely just never had to deal with it on that level or they just don’t have the time to teach a dweeb like me. But, I have a couple of fellow growers that I correspond with and Mark Ryan was a wealth of information when i visited him for a tour, and he “gets” the hobby growers. Great guy. At this point, I too am still experimenting, but I am freely willing to help anyone who wants to grow. Because someone just getting into this may discover something that I overlooked. IMO, am an open book. I have no secret recipes and no products to protect. Hopefully, we can get more people into this aspect of the hobby, especially if the cigarette industry buys out or ruins our current market for finer tobaccos due to the FDA.